If you were the victim of a dog bite or animal attack in Florida, you may be entitled to money damages and may have other rights. Florida law often limits the time to bring a claim following an animal attack. If you have any questions, please feel free to call us for a free consultation. You can call us any time at 800-337-7755 or submit your inquiry online. We are here to help answer your Florida dog bite questions and to walk you through the dog bite negligence claim process. Photograph any scars or marks from the dog bite in Florida. You should take photographs of your dog bite injuries if you have any visible scars, cuts or bruises. As your body heals, these bite or scratch wounds may become less apparent. It is important to show the dog or animal owner or their insurance company what your injuries were like and any residual scars. We handle dog attack negligence claims throughout all of Florida! Our Florida law firm can handle dog bite and animal attack cases in every city and county in Florida, including Ft Lauderdale, Miami, Tampa, Key West, Orlando, Panama City, West Palm Beach, Ft Myers, Naples, Pensacola, Tallahassee, Coral Gables, Winter Gardens, Broward, Dade, Kissimmee, and Weston. We handle all dog biting and animal attack cases on a contingency fee. This means that you do not have to pay our firm any money out of pocket to help with the case. We only get paid if there is a recovery. We also waive all fees and costs if there is no recovery. Our staff is trained to help you with your FL dog bite case and to be passionate about their jobs. We understand that you did not ask to be in this situation. The least we can do is care. Florida Homeowner Dog Bite Claims can be filed if you are bitten by a dog, scratched by a dog, mauled by a dog, or even accidentally bumped or jumped on by a dog. We can file a claim against a dog owner, a landlord, or a business owner whose dog caused your injuries, or if a property owner or landlord knew there was a dangerous dog on the property and failed to take the proper and necessary precautions to protect property guests. Under Florida Dog Bite Law, the owner of any dog that bites someone else is liable for damages sustained by the person bitten, which may include pain and suffering, medical expenses, future scar revision or medical care, lost wages, out of pocket expenses, and other possible damages. This includes anyone bitten by a dog in Florida in a public place, in a private place if the victim had a lawful right to be there, and even on the dog owner's property. Even if the dog never bit anyone or the owner had no knowledge that the dog was vicious, or if this was the first time the dog ever bit anyone in Florida, Florida's dog bite law still holds the dog owner liable for the victim's damages and compensation for the dog bite victim. A judge or jury can reduce the compensation for the Florida dog bite victim by the victim's own negligence, also known as contributory negligence. Under the contributory negligence argument, if the dog bite victim was found to be 25% negligent, that is, contributed 25% to the dog attack, then the victim's total recovery would be reduced by 25%. Florida's dog attack law has a defense for owners who post a sign which says "Bad Dog" in a prominent place on the property. The sign must be easily readable. If the owner posts this sign properly, then the owner will only be liable for damages to a dog bite victim in Florida if the victim's injuries were proximately caused by the owner's own negligent act or omission. 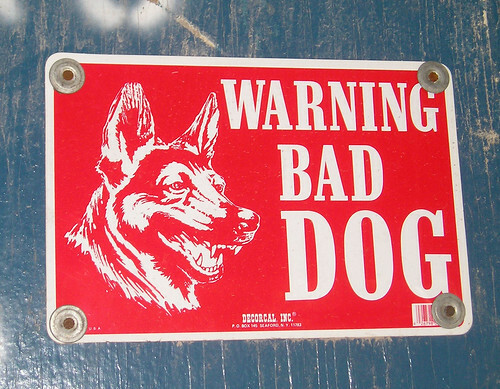 The "Bad Dog" exception does not apply when the victim is under the age of 6. Let us fight for your FL dog bite victim rights! Given the complexities of Florida’s Animal Law statutes, it is important to seek an attorney who will help navigate through the Courts and will fight for your rights. Please contact us to see how we can help you and your family with your dog bite or animal attack injury claim in Florida. You can submit your information online or call us toll free at (888) 99-VICTIM. That’s (888) 998-4284. Call us today at (888) 99-VICTIM and see if we can help with your accident, personal injury, crime victim’s rights or wrongful death claim. That’s (888) 998-4284.